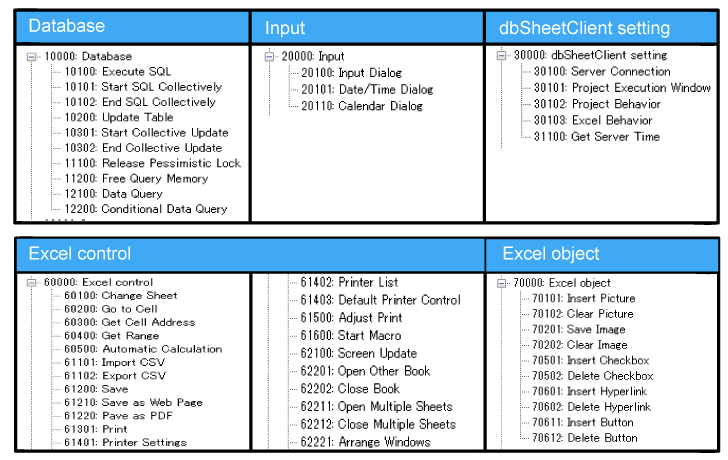 dbSheetClient Excel Version | Newcom Inc.
dbSheetClient can upgrade your stand-alone Excel Workbook into a Web-enabled system and also can incorporate Excel sheets you use in your routine operations as a user interface (UI) and store all the data in the database. * Please also browse Do you want to use the same Excel functions to create a Web-enabled system? * For more details on saving Excel data into the database, please browse Connect Excel to an Authentic Database. dbSheetClient is composed of the Development, Server, and Runtime components. As you may see from the above illustration, dbSheetClient has 3 different components. Below explains the process for each component. 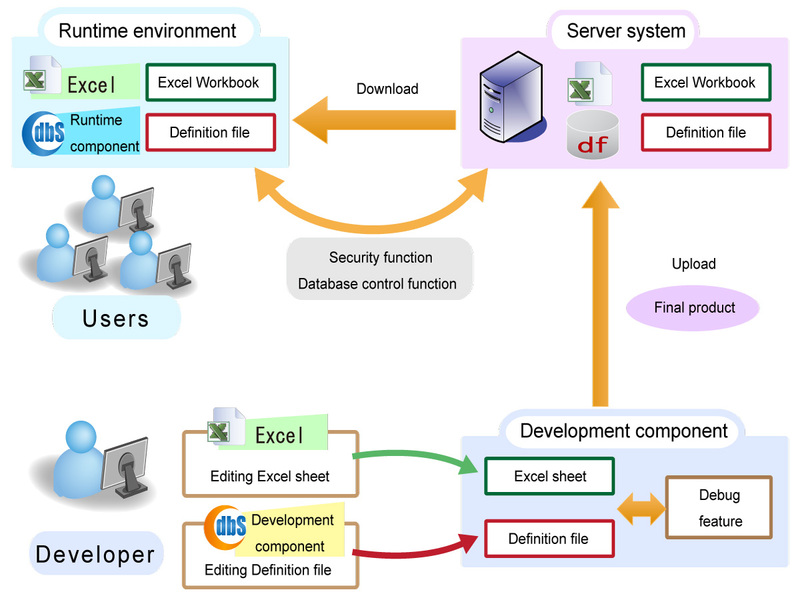 The developer uses Excel to edit the Excel sheet, and edits the definition file in the Development component. The definition file is comprised of sets of instructions that apply to the entire dbSheetClient application system. During development, you can use same Excel charts and graphs created by end users without making any changes. With the help of a debug function, the developer can complete the applications. Upon completion of development, upload the Excel Workbook and Definition file onto the server. A user logs in with their ID and password, and selects a project/an application to execute. 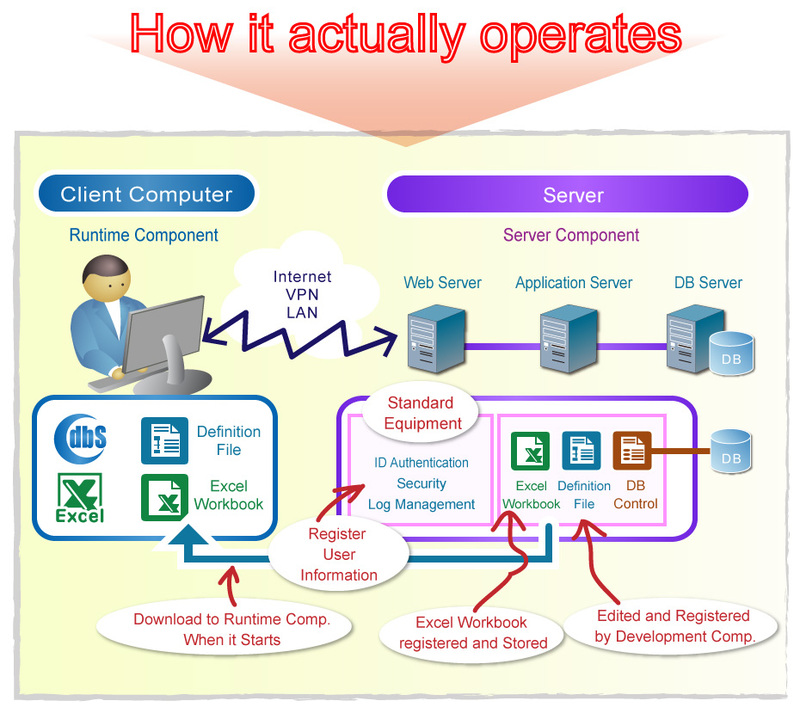 Authentication and role based access control are conducted by the Server component. 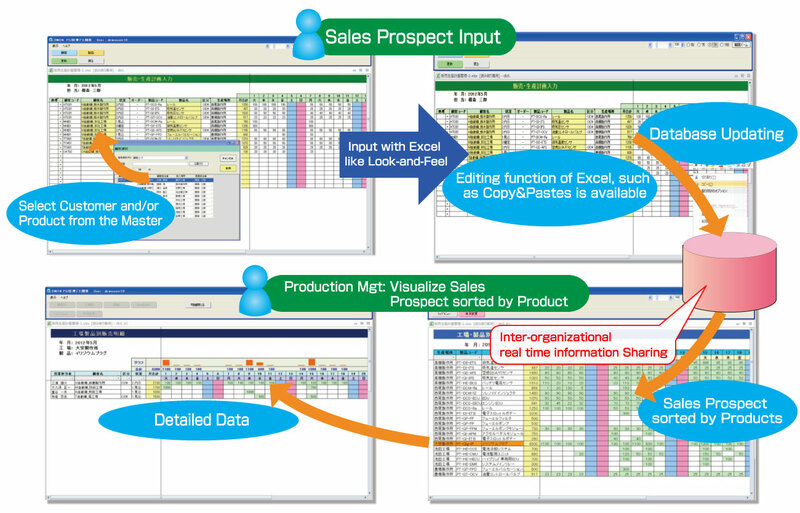 Once the project is selected, the Excel Workbook(s) and the definition file that correspond to the project are downloaded to the local client computer. Then, the Runtime component of the client runs the instructions (definition file) in close connection with Excel as the instructions are derived from the definition file by the Runtime component referring to it. During execution, when a function of the server becomes necessary, such as role based control or concurrent access control, the Runtime component can utilize it by retrieving it via the web service. The left side of the interface represents the Menu Area, where all menus are displayed. To the top is the Button Area where buttons are displayed. 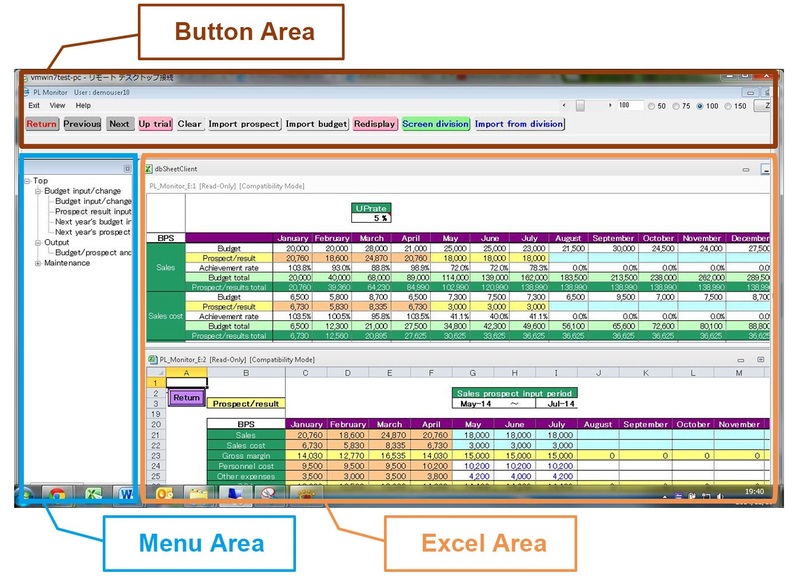 The Excel Area is where your routine Excel operations are displayed. You may hide or display the menu and/or the button areas and insert an object instead in the Excel Worksheet, which takes on the same role as the buttons. The buttons are assigned to a menu, and when a menu is selected, the buttons are replaced accordingly. Selecting a menu or clicking a button calls for a function or combination of functions of Excel and/or the database by dbSheetClient, such as changing the Excel Worksheet to display, loading data to a Worksheet from the database, updating data in the database, and so on. To execute various tasks designated to each menu or button, dbSheetClient implements those tasks using Task Types, which are basic parts that implement the functions assigned to menus and buttons in the Development component. Each category has got sub-categories, so far we offer more than 90 task types. Excel Worksheet for routine operations can be used as UI main table. dbSheetClient Runtime component is what end users work on for their jobs. The great advantage of the UI of the Runtime component is that Excel sheets, which they are very familiar with, can be used as the front screen. Therefore, the new functions that end users have to learn will be minimized and thus the smooth introduction of the system can be achieved.